The dust has now settled on the UN Sustainable Development Summit, where states adopted the 2030 Agenda - including the Sustainable Development Goals (SDGs) - amid much fanfare. Before implementation of the SDGs begins, the next major step is deciding on a set of indicators that will measure progress towards the 17 goals and their targets. 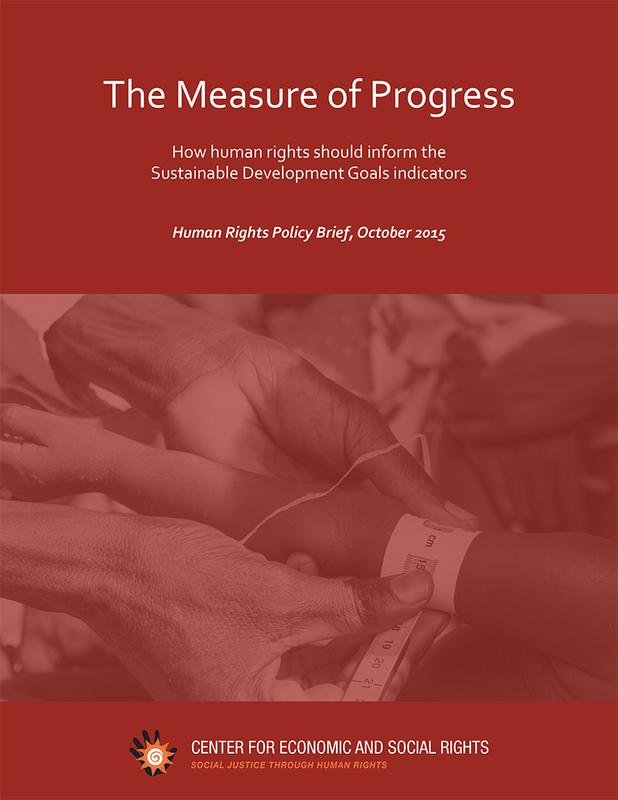 A new CESR briefing, The Measure of Progress, explores how human rights should inform the selection of SDG indicators. A process is currently ongoing to develop a list of global indicators to underpin the targets. The stakes are high. Ultimately, the progress governments are making towards the SDGs will be judged through the lens of the indicators selected. These indicators are therefore a crucial foundation of efforts to hold governments accountable for their commitments. According to the 2030 Agenda, the SDGs “seek to realize the human rights of all”. Indeed the new development agenda could be an important vehicle for human rights fulfilment. In order to bring this potential to fruition, however, the indicators will also need to be human rights-aligned. Unfortunately, many of the indicators currently being considered are problematic from a human rights point of view, and distort or limit the ambition and scope of the targets themselves. The briefing draws on CESR’s rich experience of monitoring human rights, including in development contexts, as well as on other work in the field of human rights indicators. CESR kick-started the discussion on the relationship between SDG indicators and human rights by hosting a side-event at the UN in March with the Post-2015 Human Rights Caucus and has provided concrete proposals on indicators for Goal 10 (inequality), Goal 16 (accountable governance and access to justice) and Goal 17 (means of implementation). This new policy brief highlights the criteria that should guide the selection of indicators, and proposes a number of approaches, methodologies and indicator sets that can help to ensure the SDG indicators framework is properly anchored in human rights. Ultimately, the choice of indicators to track SDG progress cannot be reduced to a technocratic exercise. A good indicator, informed by the principles and detailed provisions of existing international human rights standards, is a crucial tool for advocacy, accountability and action. The Measure of Progress aims to inform civil society, statisticians, government agencies, National Human Rights Institutions, academics and others who are involved in the design of SDG indicators at both the global and national levels. The Inter-agency and Expert Group on SDG Indicators will be meeting in Bangkok on 26-28 October to review the list of proposed global indicators following an open consultation to which CESR contributed. For those who are interested in giving feedback or sharing their own proposals or experience, the ESCR-Net Monitoring Working Group, coordinated by CESR, will be holding a monthly discussion on this topic which is due to begin in the coming days.